“The system is flawed and how can you warn anyone for slow play when it took us two hours to play the first five holes through no fault of our own,” McDowell said. “Then when Augusta jumps up and bites you and you’re out of position, all of a sudden you have to go on the clock. “I mean a group goes on the clock all because one guy has a bad hole, so do the other guys then go on the clock, as well. “I don’t like the system as it’s not speeding up the game, and we’re out here for five to six hours and it’s hurting the spectators, and it’s not a fun sport to watch when it’s this slow and this difficult. “Augusta National is a phenomenal and the ultimate test of golf and it’s going to take a while. “But to then make an example of a young 14-year old it’s not fair. There are plenty of seasoned pros out here who need a good rocket to get a move along. “He’s probably only doing what he’s seen on TV but as I said, we don’t need to be making an example of him. Harrington was sympathetic of Guan’s predicament but pointed out that he had to play by the same rules as the rest of the field. “I do feel for him,” Harrington said. “I completely feel for him because this situation is completely new to him. But he has to play by the same rules as everybody else. The fact of the matter is that for any rookie or any kid who is not used to it, it is a very unpleasant experience. “I think the system is pretty good. As always with a lot of these things, if somebody comes up with a better idea. It always catches somebody out. Ben Curtis almost got caught out at Royal St George’s. He was a rookie and got put on the clock and completely lost his momentum and rhythm for three holes and dropped out of the lead but ended up winning. Both McDowell and Harrington missed the cut but refused to beat themselves up for their shortcomings. “I carried out the game plan pretty decently but there are a lot of tee shots on this golf course that really don’t set up for me,” said McDowell after missing out by a stroke following rounds of 73 and 75. 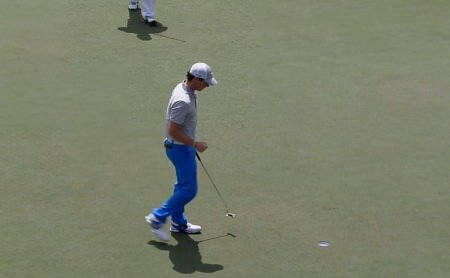 Harrington was undone by his opening 78 and simply left himself too much to do on a windy Friday, shooting 75 to miss the cut by five strokes. “They were tough pins and it was a tough day to try and make some birdies and the damage was done the day before,” he said. “I had a couple of top 10s coming in and I was prepared okay. “I would have been happy with that. I don’t look back at this and say I should have done anything different, which is always a nice sign finishing up at a major. It just didn’t go for me yesterday. “I am happier with my putting for sure (this year) but I am not hitting my wedges as well as I hit them last year or playing as well tee to green. But I am putting better and chipping better. 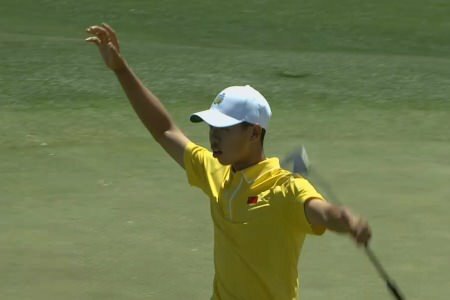 As for Guan, the boy wonder shot a third round 77, holing a monster 80-foot par putt up a tier at the 18th to finish tied 59th on nine over par. Padraig Harrington will not be joining the belly putter brigade. 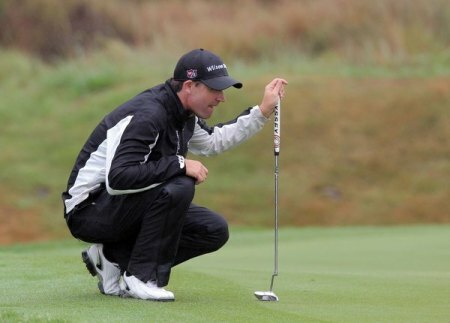 Photo by Carl Fourie www.golffile.iePadraig Harrington has rejected the belly putter as the solution to his current putting crisis.